Punxsutawney Phil (1) may have seen his shadow, but here in San Diego we see harbingers of spring. 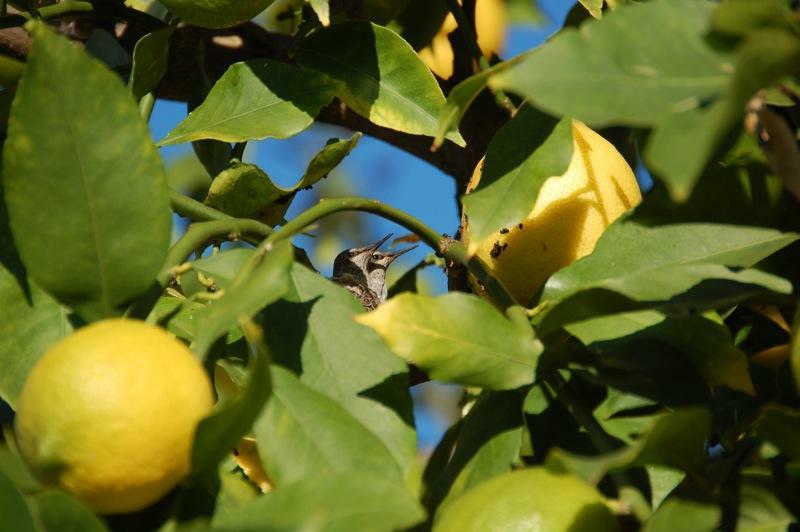 Even before we departed for the Ghost Mountain area in the Anza-Borrego Desert State Park, our lemon tree in our front yard was laden with lemons, which we shared with writer and photographer, Bert Gildart, who was out in Anza-Borrego photographing nesting hummingbirds. 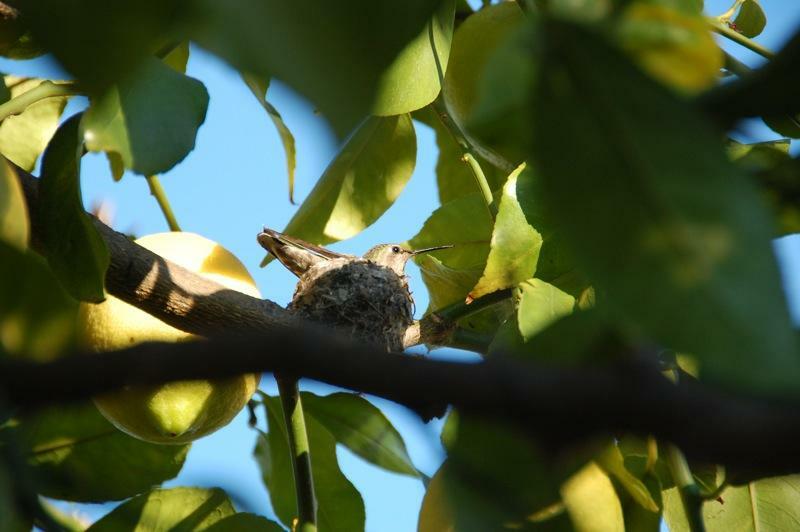 Just before leaving for the desert we spotted a mother hummingbird sitting in her nest in our lemon tree. Marshal South and family created a home on Ghost Mountain and lived out an experiment in primitive living for about 17 years. 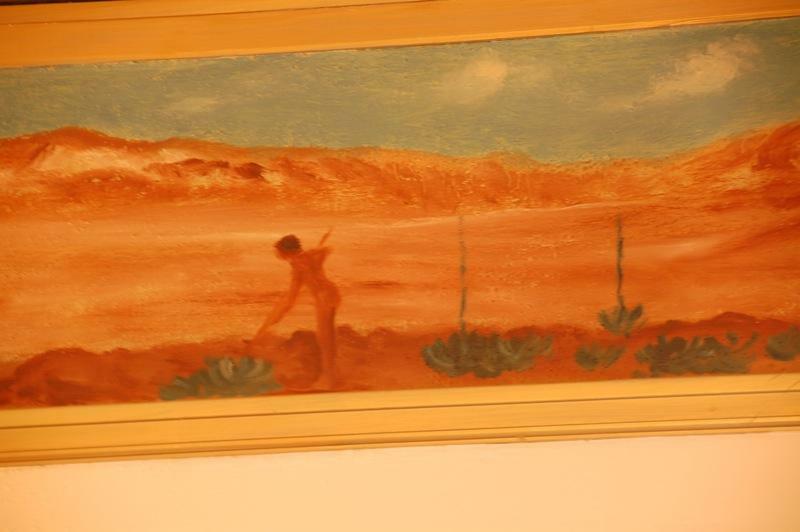 Poet, author, and artist Marshal South named his house and home Yaquitepec which comes from “Yaqui“, the freedom-loving Indians of Sonora, Mexico, and “tepec“, the classical Nahuatl (Aztec) word, meaning “on a hill; on a mountain”. 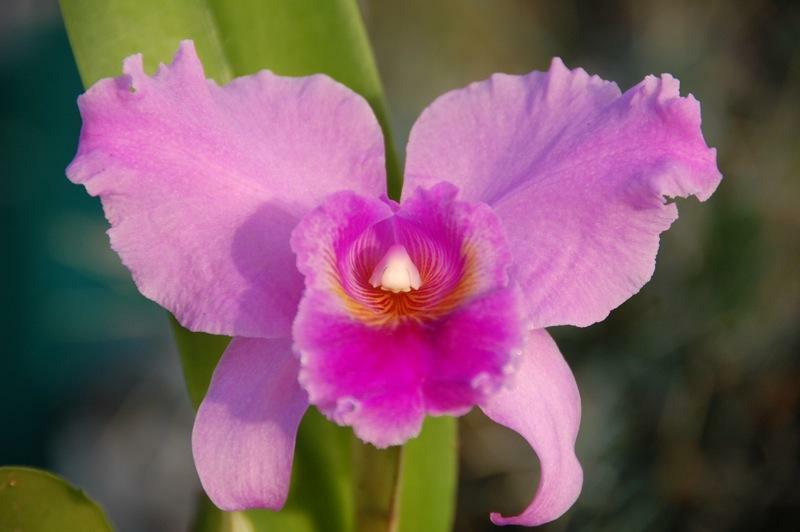 Yaqui sacred tradition centers around nature as a living university where spirits are acknowledged with love and respect as the living beings that they are. Diana wishes you to know that there is a new website currently under construction, which will be hopefully open in a few weeks: www.marshalsouth.com where she will be offering published and unpublished works by Marshal and Tanya South in addition to many unpublished photos of the family and Marshal’s artwork. Diana will also have a blog to carry on conversations about the Souths. 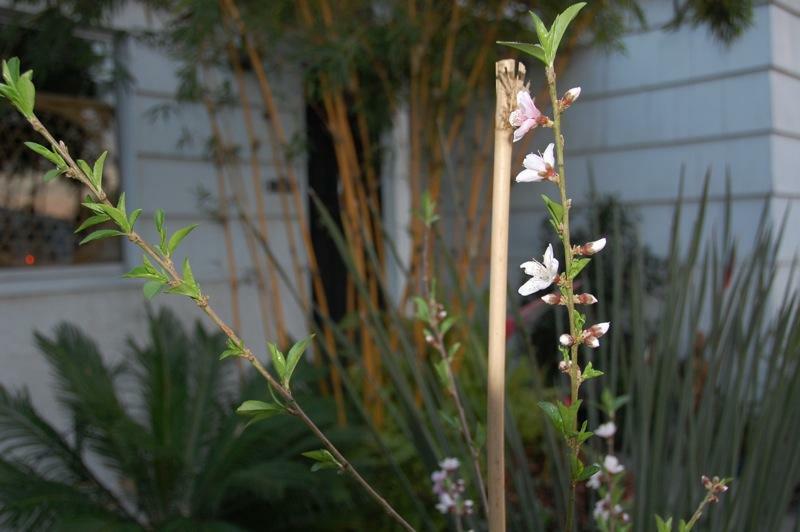 Just before our last trip to the desert, we planted a bare root Saturn Peach. 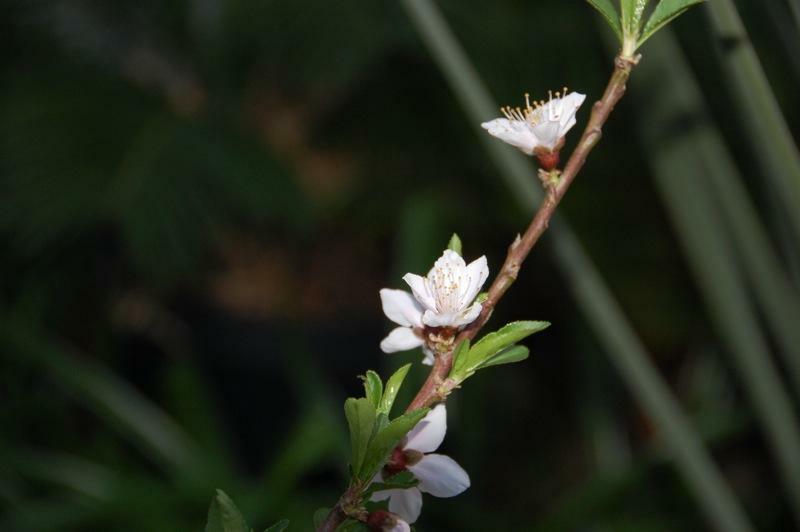 The peach is native to China. 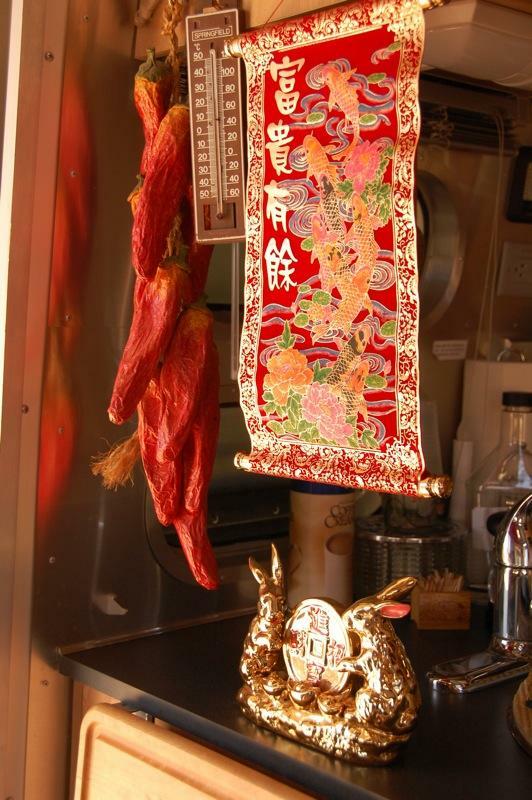 Some of the symbolic images on the table include two (Chinese lucky number) whole fish (abundance, prosperity, long life), two flying seagulls and the red dragon. 1. Punxsutawny Phil is a groundhog resident of Punxsutawny, Pennsylvania. 2. Marshal South and the Ghost Mountain Chronicles: An Experiment in Primitive Living, 2005, Edited and with a Foreword by Diana Lindsay and Introduction by Rider and Lucile South, Sunbelt Publications, San Diego, CA. 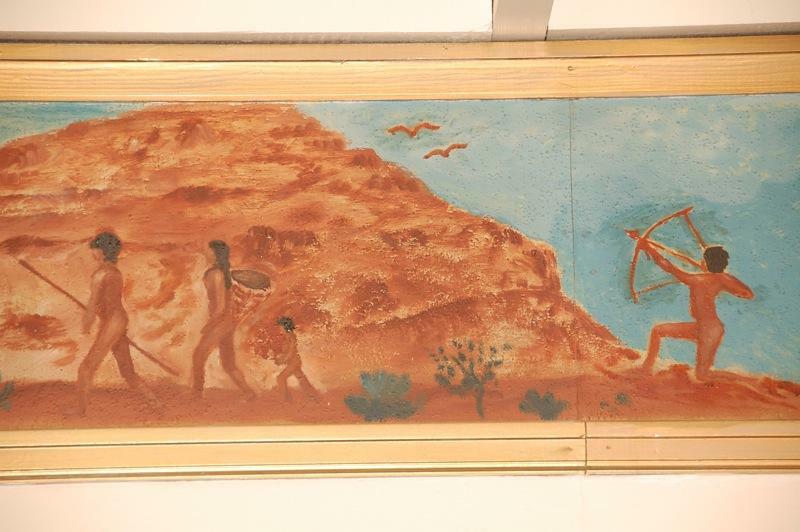 Marshal South’s frieze in the former Julian Library also depicts a time when the Kumeyaay Indians lived in an oasis just south of Ghost Mountain. 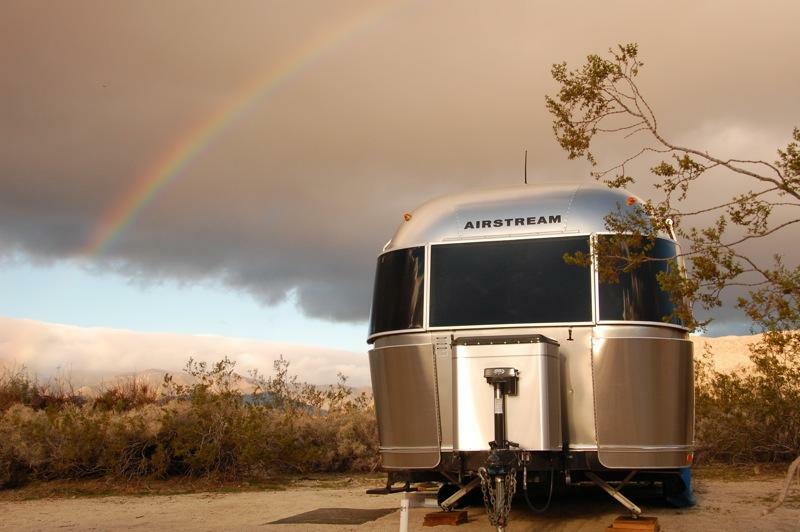 It is supplied with water draining down from the nearby Laguna and Sawtooth Mountains. Plants are plentiful in this mesquite-shaded area, including edible plants such as Agave and Yucca. The outbreak of the war with Mexico in 1846 and the California Gold Rush (1848-1852) brought increased traffic, including emigrant caravans through this area. 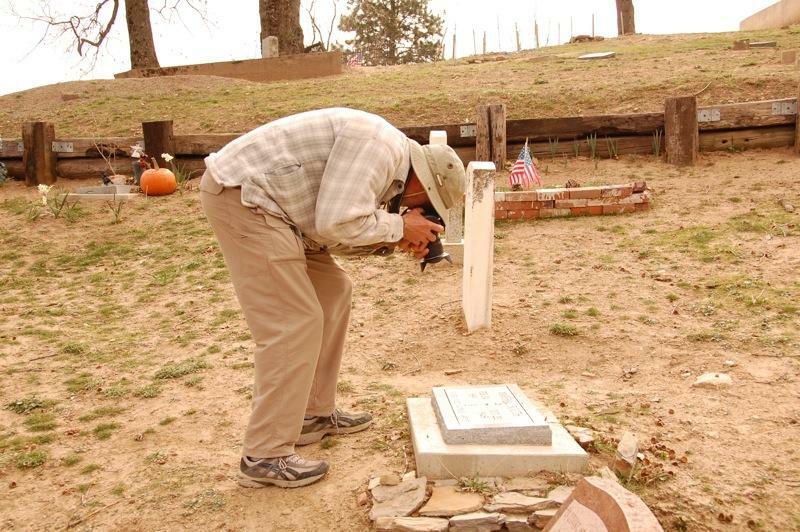 The name for this area is Vallecito, Spanish for “little valley”, and has been credited to Lt. Pedro Fages, who came searching for deserters from the San Diego Presidio in 1772. (1) The first road for wheeled vehicles was built here by the Mormon Battalion on their way to San Diego in 1847. (2) In the early 1850’s a stage station was constructed using sod from the nearby salt-grass cienega (3), which was used by the Jackass Mail, 1857-1859, and followed by the Butterfield Overland Stage. 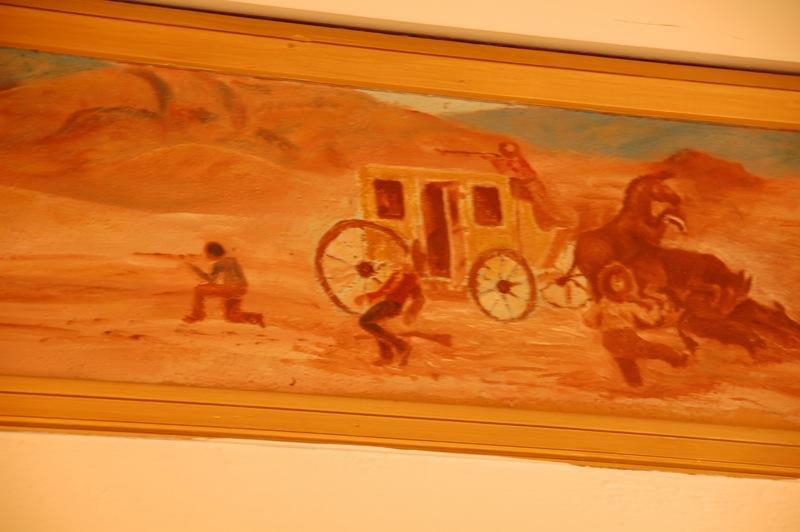 Stagecoach attacks and holdups were not uncommon in the area. There is a story of one stage holdup that resulted in a double-murder. It is said that the leader of the gang of thieves, while riding a white horse, shot his companion to avoid dividing up the loot. It is also said that sometimes the ghost of the white horse can be seen galloping by at midnight. 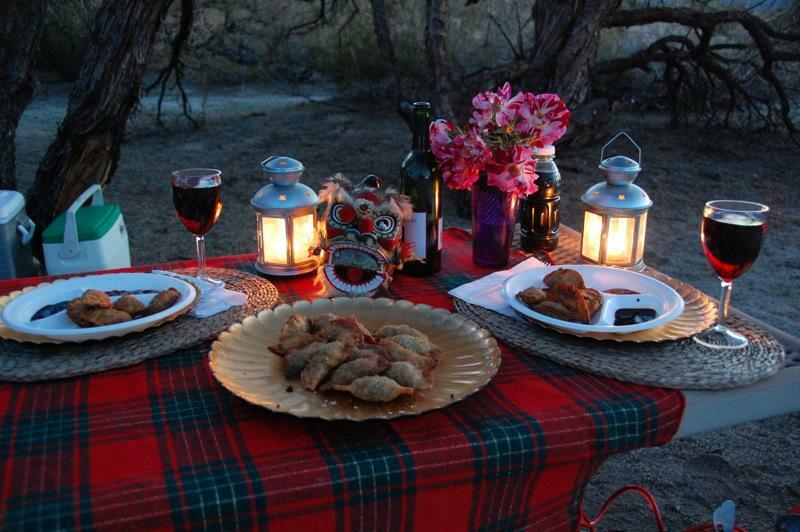 In the mid 1920’s Marshal South and his wife Tanya began taking camping trips to the desert. They often stayed at Vallecito until Tanya reportedly saw the ghost of the white horse (4). 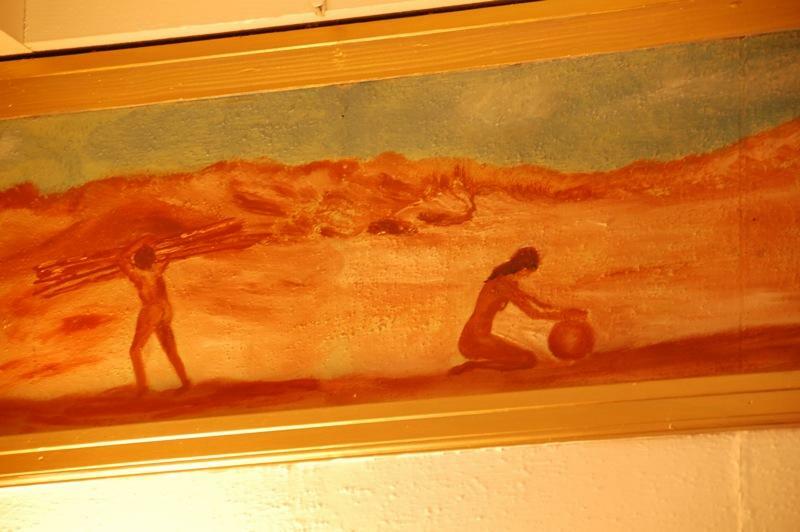 and depicted in his frieze in the Julian Library. 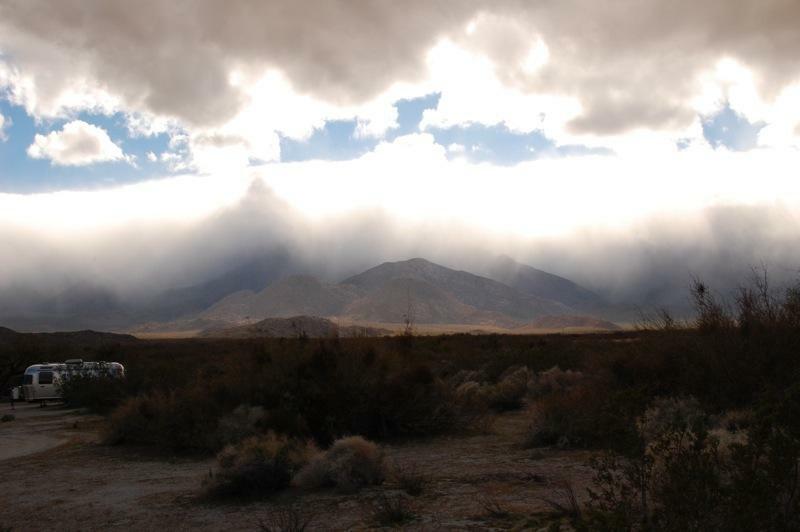 After a full afternoon of following the trails and mysteries of the Marshal South story, Bert Gildart and I returned from Julian, the final resting spot and “last known address” of Marshal South and the location of his frieze just as rain clouds were pouring over the mountains. 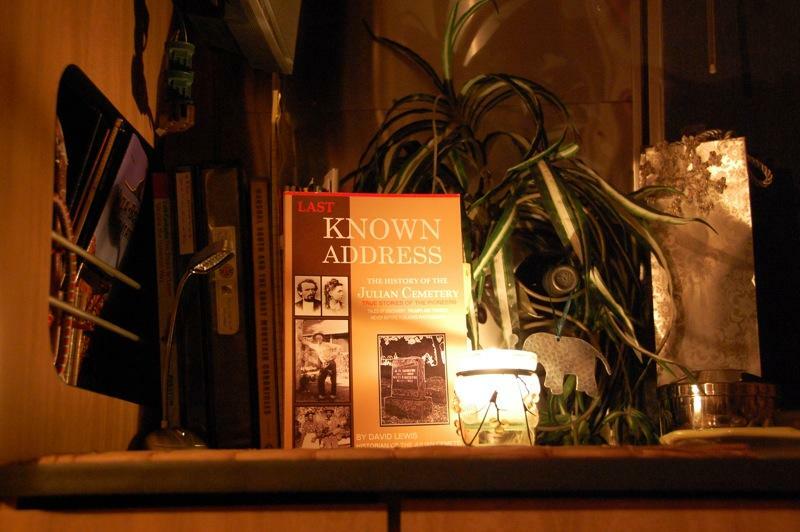 It will take more than a candle to fully illuminate some of these mysteries. Thank you, Bert for brightening our day and for getting excited about Marshal South’s story and our (Bill and Larry’s) story, as evidenced in your superb post, “Ghost Mountain or Brokeback Mountain? Maybe There Is No Choice“. 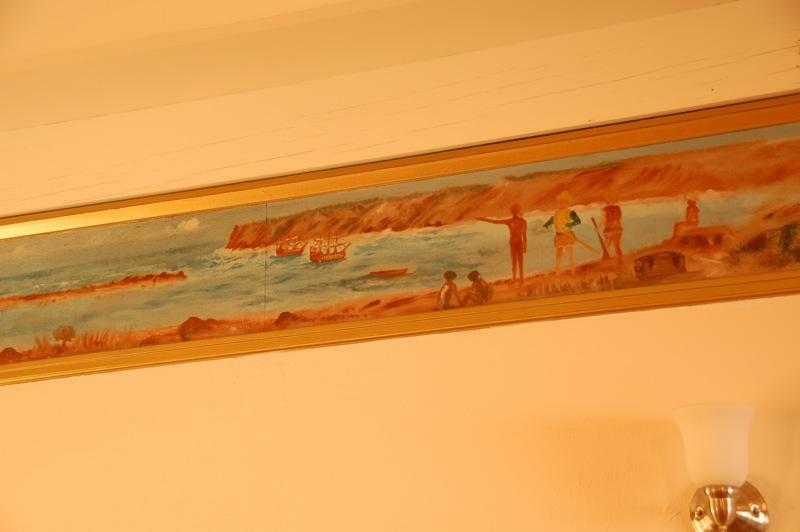 Marshal South’s frieze in the former Julian Library is a mural on all four walls with myriad images and symbols depicting a variety of peoples, cultures and places, apropos for a library setting, and beckoning its viewers to further explore, read and learn. A number of images show how the Native American Indians lived, including activities such as hunting, gathering, fire tending, and pottery making. 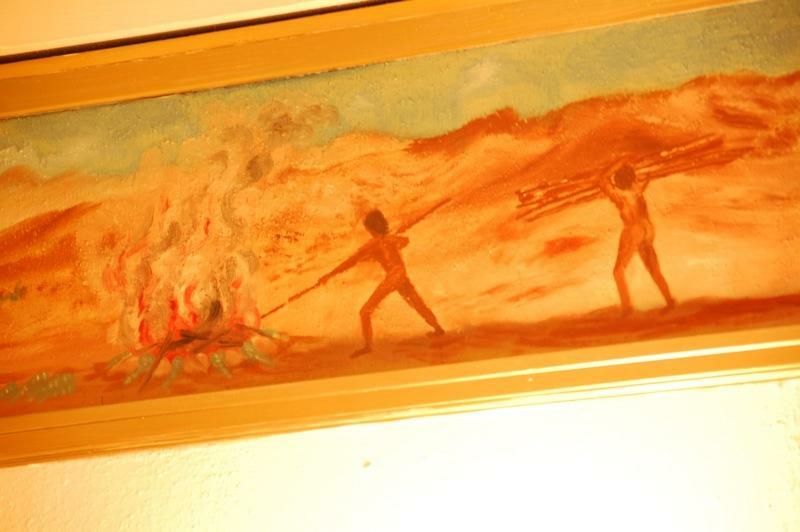 These are also activities that Marshal and his family did at Yaquitepec on Ghost Mountain during their experiment in primitive living for over 15 years. My previous article showed Marshal’s depiction of Juan Rodriguez Cabrillo‘s arrival in 1542 in what is now called San Diego. Twenty years earlier, Cabrillo was assisting conquistador Hernan Cortes in destroying the ancient Aztec capital, Tenochtitlan, which was rebuilt and became Mexico City, the capital of Mexico. 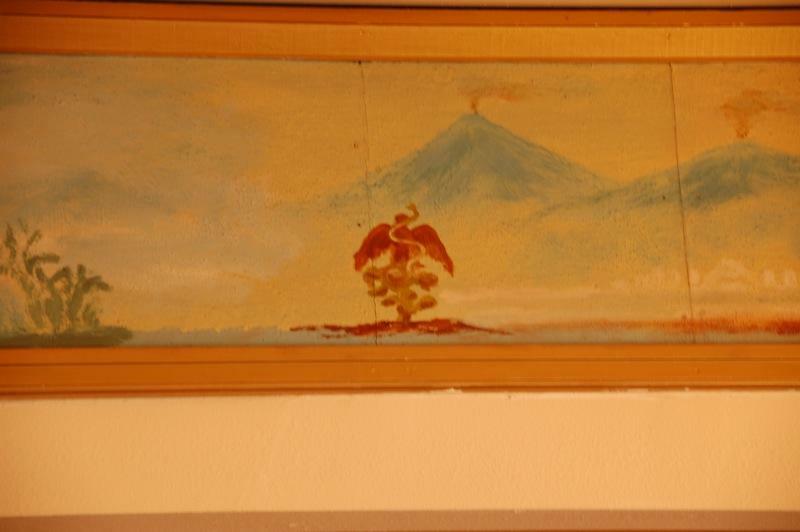 Marshal painted an Aztec temple in his frieze and also an image of an eagle holding a snake on a cactus, which is also the coat of arms of Mexico. The coat of arms of Mexico appears to be based on the Aztec image on the first page of the Aztec Codex Mendoza, depicting the founding of Tenochtitlan. Note that the Aztec image of the eagle does not contain a snake. Wikipedia’s article, Coat of arms of Mexico, suggests that the element of the snake was added to conform with European heraldic tradition, and would represent the struggle between good and evil, and could be used by the missionaries in the conversion of native peoples. Also note that Marshal South used the image of the cactus, eagle, and sun (but no snake) as a symbol of his House of the Sun philosophy (and his booklet of the same name) and his son Rider had this symbol placed on Marshal’s grave site marker. History is replete with civilizations rising and falling. In the image below, Marshal juxtapositions a pyramid next to a flaming city under attack. Was it because when he and his family came into town they looked different, wore different clothes, and had longer hair? Was it because word had spread that Marshal and the kids ran around naked up on the mountain? Was it because they thought the kids were not being educated in school and not going to church? The children were home-schooled by their parents while living on Ghost Mountain. Note 1: The Ghost Mountain Experiment, Directed and produced by John McDonald, 76 min., 2008, and previewed here. Note 2: For further reading: Marshal South and the Ghost Mountain Chronicles – An Experiment in Primitive Living, Edited and with a forward by Diana Lindsay, Introduced by Rider and Lucile South, Sunbelt Publications, Inc., 2005, ISBN: 0-932653-66-9. 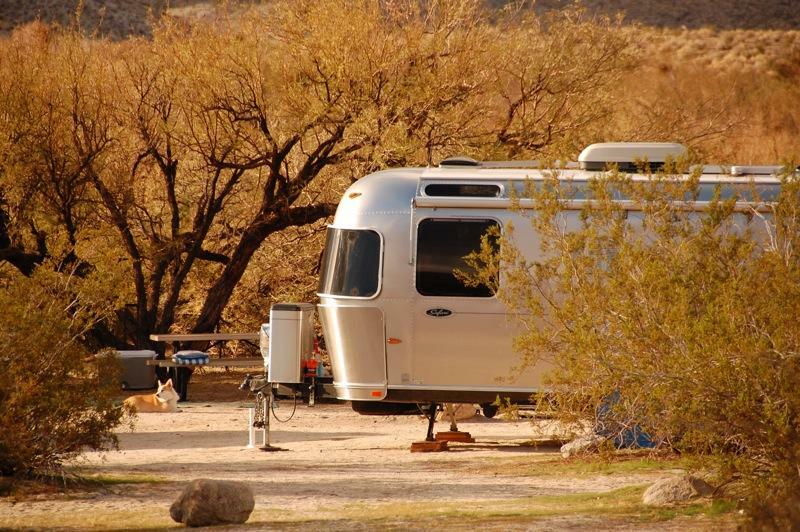 Modern-day Peg-legger, writer and photographer Bert Gildart arrived at our campsite below Ghost Mountain bright and early with enthusiastic, positive energy and sensitive curiosity. 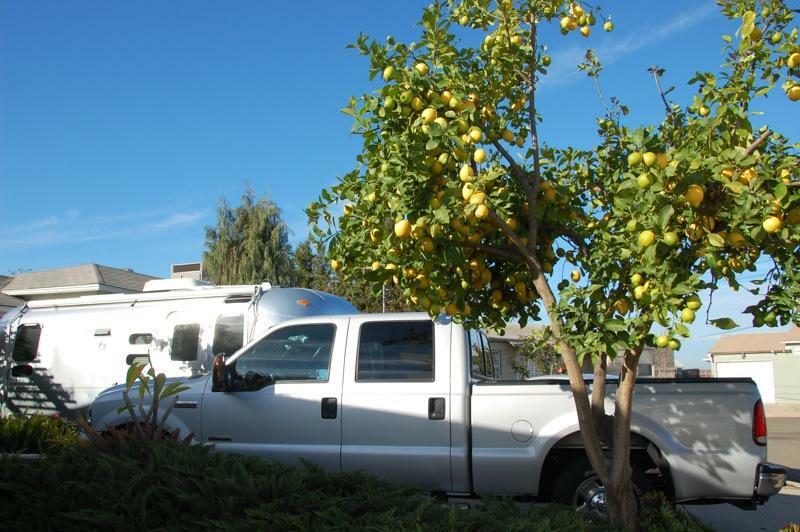 He took notes as we showed him our space-saving solutions inside our trailer and then we sat around the picnic table under the mesquite tree and chatted for the next two hours on a variety of topics, issues and concerns. I pointed to one of the ridges on nearby Ghost Mountain and said that is Yaquitepec, where Marshal South and family had their experiment in primitive living as detailed in Diana Lindsay’s, Marshal South and the Ghost Mountain Chronicles and brought to life in the recently released full-length documentary, John McDonalds’s The Ghost Mountain Experiment. 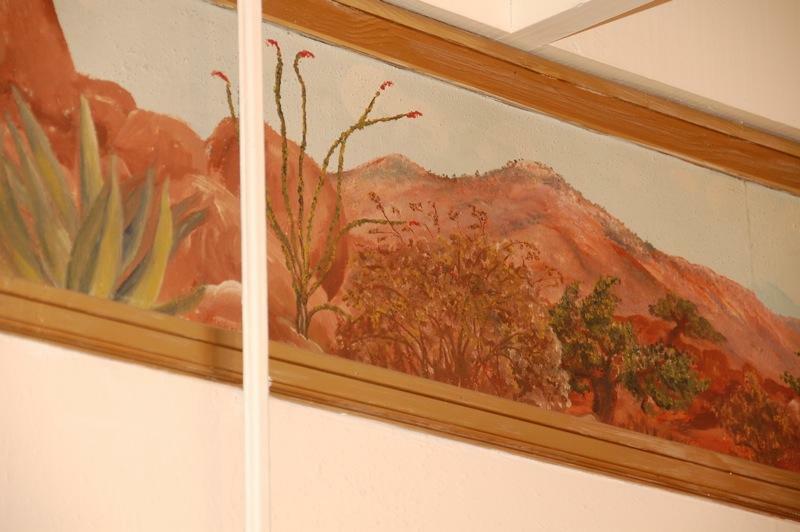 Last week Bert hiked up to Yaquitepec, and now he was interested in retracing Marshal’s monthly trip into Julian, 14 miles away up Banner Grade, where he mailed in his monthly articles to Desert Magazine, picked up mail and supplies, painted a frieze in the Julian Library, and where he was buried. So I grabbed my camera and day pack and Bert drove up to Julian for the first time (going from an elevation of 1500′ to 4000′ and from a temperature of near 70 degrees to near 50). Upon arrival, Bert shared a sandwich that Janie had made and then I took him up the Casket Walk of the Julian Cemetery and showed him Marshal South’s gravestone marker (with its symbols of the cactus, eagle and sun) that his eldest son Rider had placed in 2005, after the site had been determined by David Lewis of Julian based on information in a letter written by former Julian librarian, Myrtle Botts, who befriended Marshal. As the cold wind picked up and the rain clouds rolled over, I took Bert down the hill to the center of town for an opportunity to photograph the frieze that Marshal painted in the Julian Library in the fall of 1946 in exchange for Marshal being able to live there in the library with the permission of librarian Myrtle Botts. (Marshal’s spending more time in Julian was one of the factors leading to his wife, Tanya, taking the kids off Ghost Mountain and seeking a divorce.) 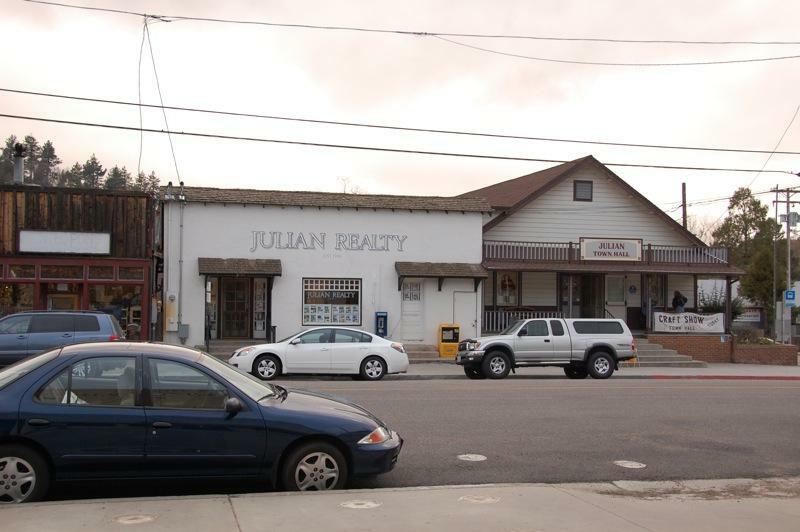 This former library is now the home of Julian Realty and is next to the Town Hall. I suggested that Bert go in first and, if getting permission, do a photo shoot. After a few minutes, I started to see flashes from his camera so I knew he had succeeded. After 20 minutes or so he came out and took me back in and introduced me to the one lady there and, after getting her permission, I quickly took photos of the frieze on the upper portion of all four walls, which must have been just above former stacks of library books. 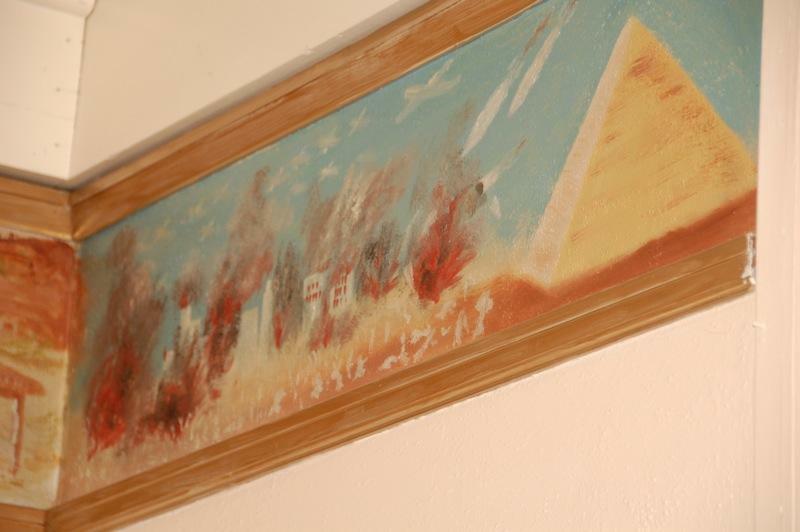 Using historical, spiritual and religious symbology, the frieze depicts the story of people from the cradle of civilization (Egyptian pyramid) to the horrors of World War II (planes flying over a city in flames as bombs and rockets fly). 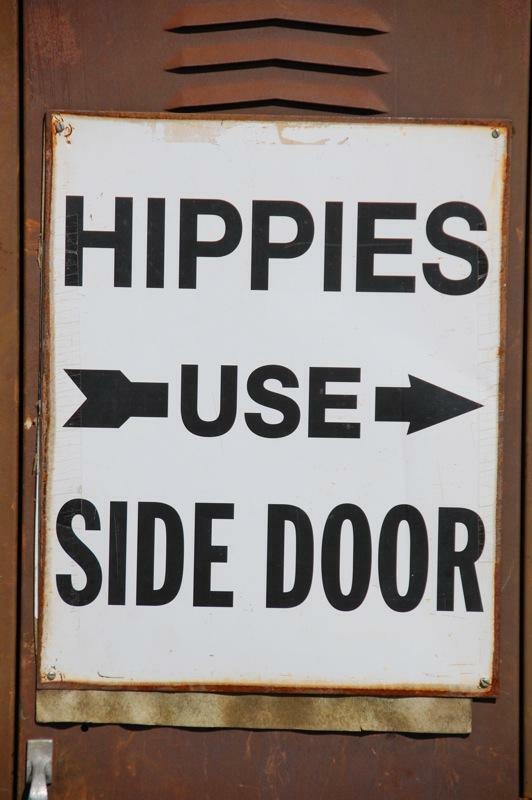 Much of history is subjective and I’m sure much of what I saw can be interpreted in many ways. 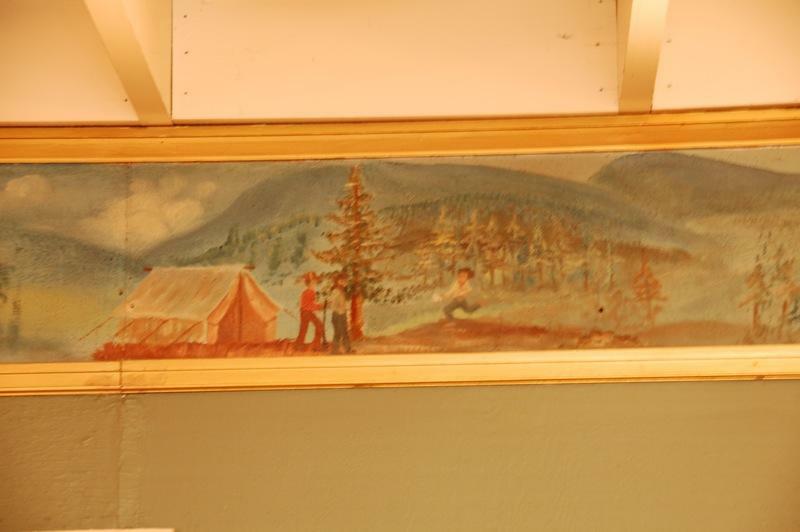 For example, the frieze image below suggests to me the beginnings of the town Julian, which was at first a tent city when quartz gold was discovered in 1870 by Confederate Drury Bailey, from Georgia. 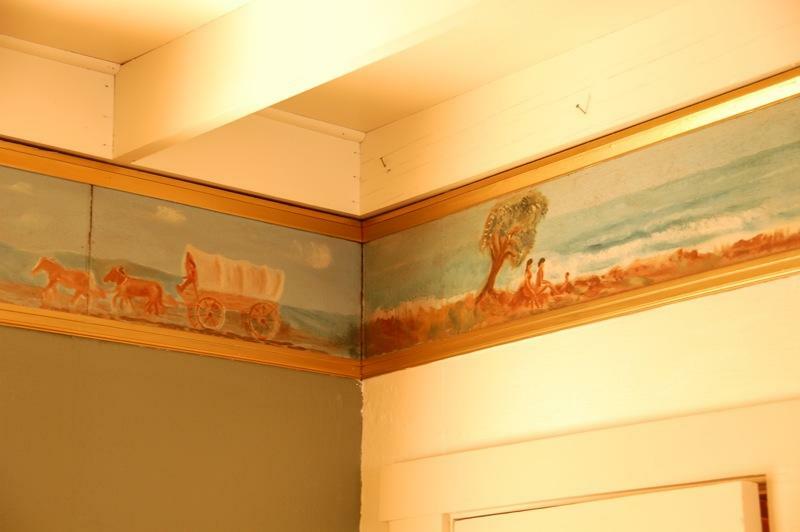 He homesteaded 160 acres of land, laid out a town, and named it after his cousin Mike Julian. In 1542 Juan Rodriguez Cabrillo, the first documented European to sail the Western shore of North America, sailed under the Spanish flag into what is now called San Diego Bay and named it San Miguel. His burial place is still a mystery. 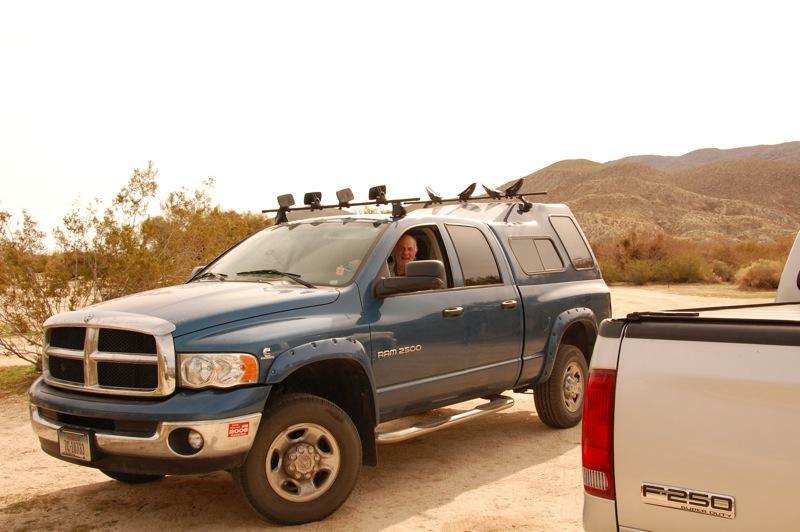 More trails and mysteries will be explored in my next article, “Desert trails and mysteries, 2”. Meanwhile, here is music (and history) to listen to while contemplating the first California Gold Rush. 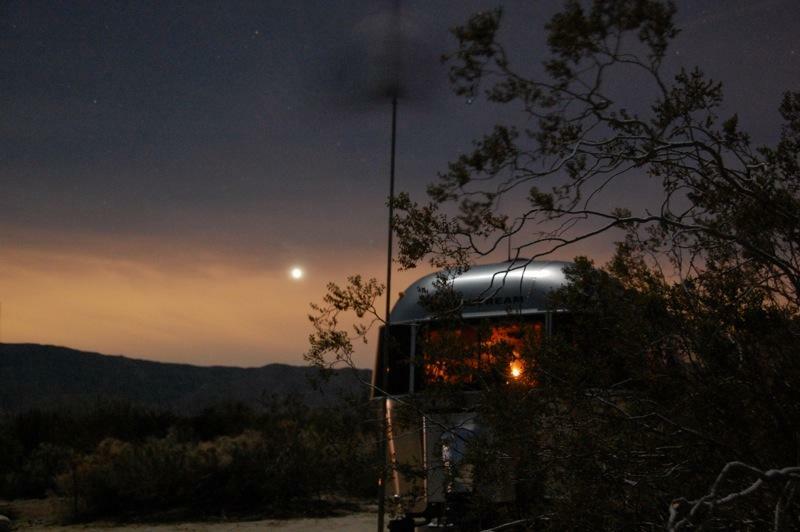 There was a wind advisory for Interstate 8 East travelers so we did a short hop over the mountains via Banner Grade and safely landed and set up camp under the brilliant evening “star” Venus. Our landing day weather was clear with temperatures in the seventy’s. It was an auspicious beginning. 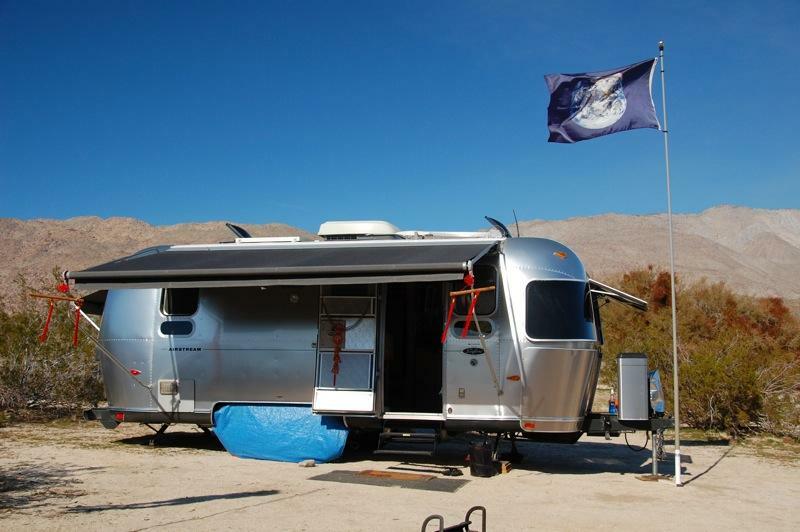 Below Ghost Mountain in the Anza-Borrego Desert, we raised our Earth Flag and set out a pair of Chinese bamboo flutes. According to Feng Shui, bamboo flutes are generally hung by red cord with tassels and represent qualities of power, safety, peace and endurance. 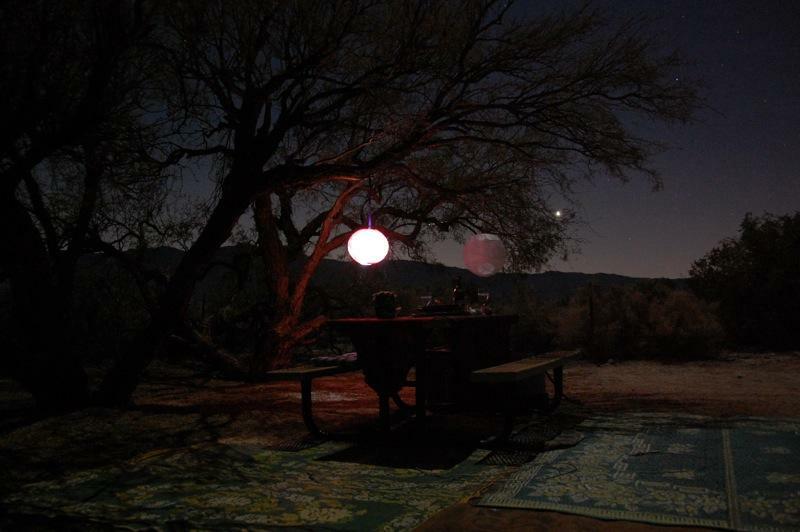 and hung Oriental lanterns from the nearby Mesquite tree. 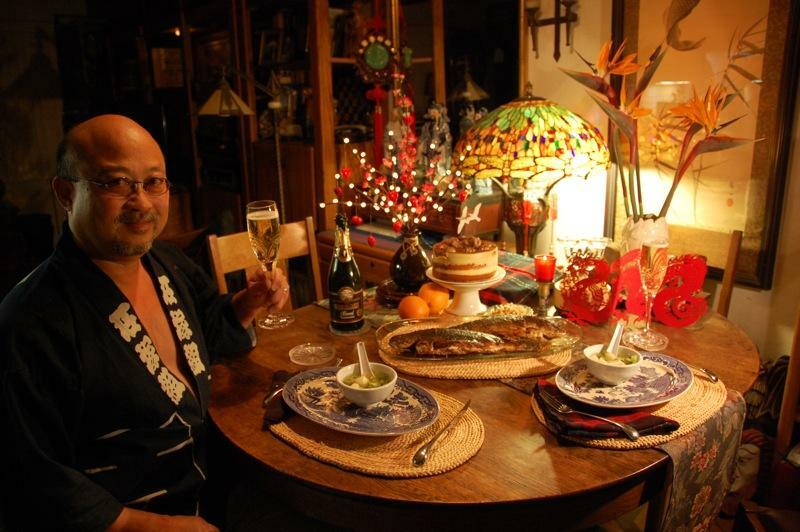 Larry made deep-fried Chinese pork-shrimp dumplings, shaped like gold ingots for prosperity and served with plum sauce for a sweet new year. 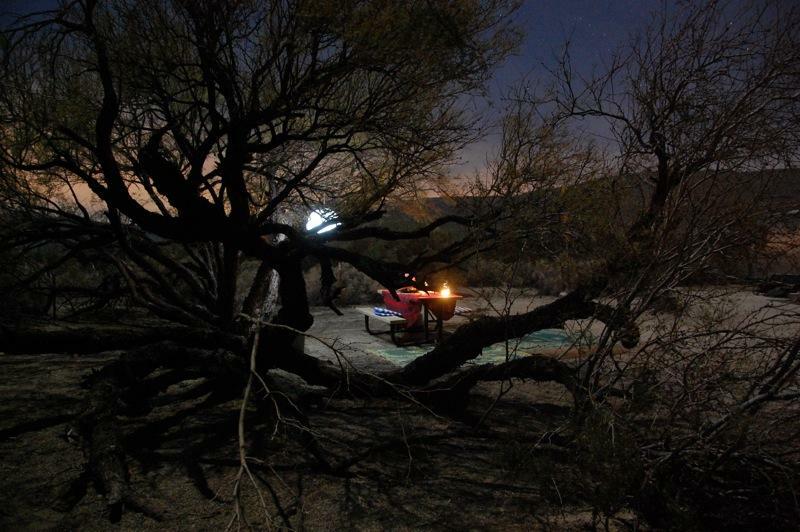 After dinner, I enjoyed the ambiance of the Mesquite trees embracing our camping space while I continued further explorations of night photography. I also continued to contemplate the mysteries surrounding Ghost Mountain, Yaquitepec, Marshal South and his trips to nearby Julian, and why some in Julian still refer to him as a “useless oddball”. 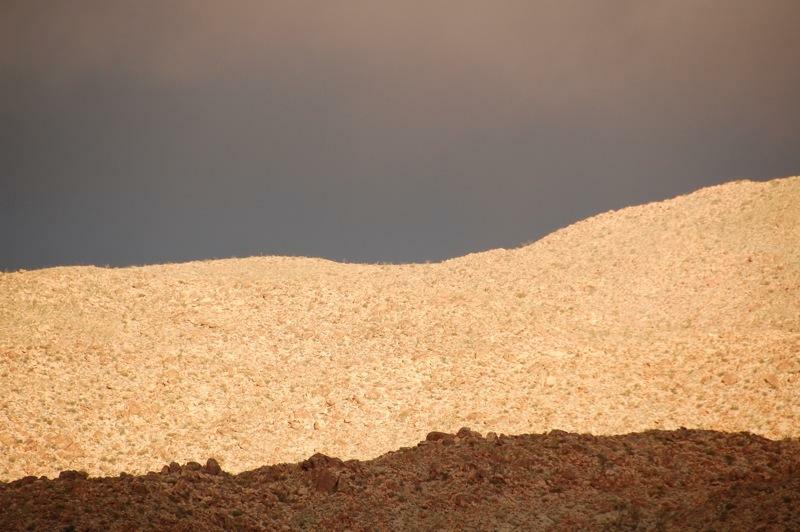 Last week writer, photographer Bert Gildart again hiked up Ghost Mountain to Yaquitepec and wrote why he is still fascinated with the Marshal South story in his post, “Nonconformist Marshall South and the Stubborn Fishhook Cactus“. 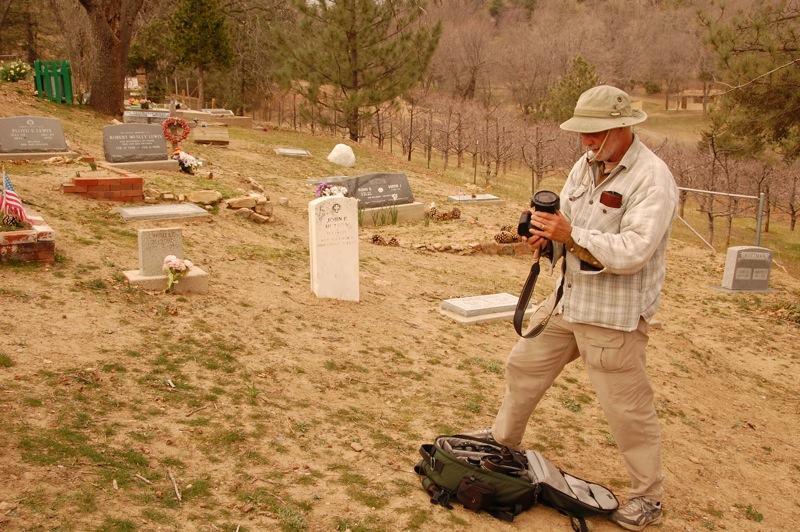 A few days later I joined him on a trip up Banner Grade to Julian where I showed him the gravesite of Marshal South and we went on to photograph the frieze that Marshal painted in the former Julian Library. 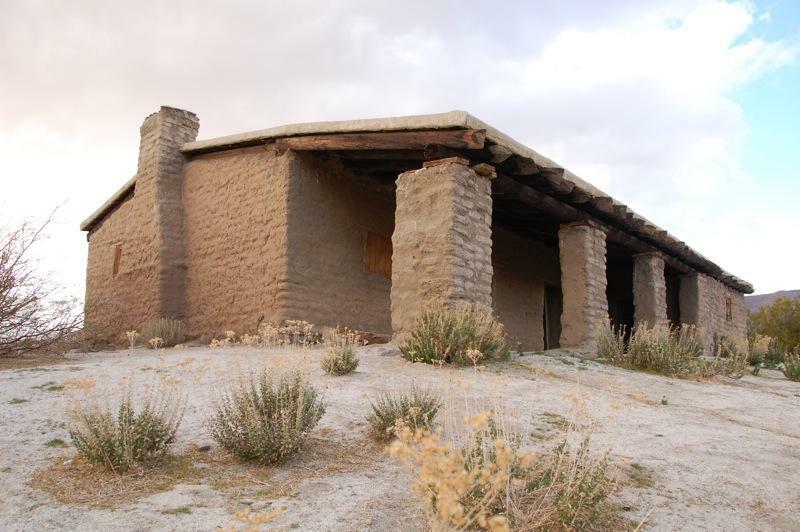 In my next article, “Desert trails and mysteries”, follow along as Bert and I visit Marshal’s gravesite and the library while we grapple with the mysteries surrounding the Souths’ and Julian.